Originally published 6 June 2013, updated 15 Sep 2015, 24 Aug 2016 & 14 Mar 2017. Before I talk about the human niche and how it might clarify what biocultural evolution actually is, I have to address something else that’s important. This has to do with the ecological concept of niche itself. Biological anthropologists have never managed to sustain a serious academic dialogue about niche and how it applies to human evolutionary history. The concept of niche is best defined–in the context of evolutionary theory’s emphasis on the role of the environment in shaping natural selection on heritable phenotypes–if we construe it holistically, as Hutchinson (1958) and Whittaker et al. (1973) originally did … and as Odling-Smee et al. (2003) formalize in niche construction theory. There are signs that things are changing (Fuentes 2014; Hill et al. 2009; Kaplan et al. 2010; O’Brien & Laland 2012; Pinker 2010; Riel-Salvatore 2010; Wells & Stock 2007). But there’s surprisingly little discussion about what the human niche is in general. This is a problem with how we use evolutionary theory to explain our place in nature. Our species, Homo sapiens, has recently succeeded in altering, disrupting, or destroying the ecological niches of seemingly countless other species, mainly over the past 200 years. Given that ecosystems are complex interconnected evolving natural systems, two obvious questions follow. First, might our own niche have something to do with our disruptive effect on other species’ niches? Second, if our role in Earth’s biosphere today is as a “disequilibrium maker,” might knowledge about the long-term evolution of our niche help us better understand our current situation? There are thus applied as well as theoretical reasons for substantively figuring out the human niche. As I discuss below, the human niche can be described in a pretty straightforward way that’s fully in line with broader contemporary definitions and approaches in ecology, and this helps us to apply a highly useful, general approach from Niche Construction Theory (see the NCT website) to clarify the process of niche-adaptation co-evolution in the hominin lineage. In taking the “NCT” approach, we can then better see how biocultural evolution emerged as a unique derived hominin trait–not an adaptive trait per se, but an “extended phenotypic” aspect (á la Dawkins 1982) of hominin niche-adaptation co-evolution. In the big picture one of the main take-aways comes into focus when you remember that late 20th century biological anthropology came of age just as the Modern Synthesis in evolutionary biology took hold. Thus, in using fossil, archaeological, paleoenvironmental, primatological, genetic and other kinds of evidence, biological anthropologists have successfully documented striking patterns of speciation, adaptation, and extinction, spanning over roughly 6-7 million years of hominin prehistory. And this work is ongoing, leading to exciting finds and insights. In advancing this inquiry, we have very substantially warranted a key argument. Our place in nature has resulted from common micro- and macro-evolutionary processes. Speciation, adaptation, and extinction in hominins can be fruitfully compared–on the same fundamental theoretical grounds–with the same macroevolutionary phenomena in non-human primates, birds, or fish. Although biological anthropologists are certainly aware of niche concepts and their uses, we have certainly been more interested in other macroevolutionary and ecological phenomena. We have tended to restrict our attention now and then on very specific aspects of niche. Now, it might be habitat. Then, it might be the prey spectrum and omnivory. Occasionally, researchers have been concerned about how predation on early hominins may have shaped selective pressures (Hart & Sussman 2005). Notably, Tooby and DeVore (1987) emphasized a particular aspect of the environment to which the genus Homo evolved an adaptive fit: the “cognitive niche.” Still, textbooks on biological anthropology and human evolution–while they may have clear glossary definitions of “adaptation,” “speciation,” and “extinction” … not to mention “biocultural evolution”–do not clearly define the niche or niches that have co-evolved with major macroevolutionary developments over the past 6-7 million years, roughly when the hominin lineage evolved a reproductive barrier with the chimp-bonobo (panin) lineage. 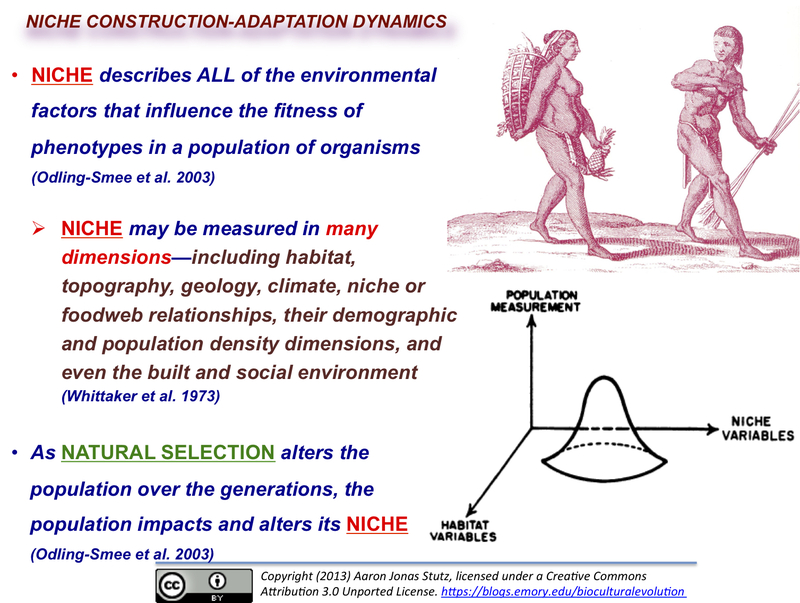 Even among textbook authors interested in niche evolution, (consider Agustin Fuentes’s  very clear, synthetic but concise Biological Anthropology: Concepts and Connections), basic ecological concepts are introduced, but niche evolution is not applied to encourage critical thinking, as say, speciation and adaptation are. This leaves the question: can we come up with a good textbook definition of the human niche that can inspire deeper understanding and further inquiry? An important conceptual tool is now available: Niche Construction Theory. O.K. I know that NCT can give a first impression of being mainly about unnecessary jargon. After all, some of its earliest contributors and cheerleaders quickly raised it to the level of “theory.” This can lead to cynical thoughts. Not a bad polemical strategy. Or maybe simply not everyone involved was satisfied with “niche construction process (NCP)” or “niche construction concept (NCC).” Like other technical neologisms, “niche construction theory” can give the impression that its authors were trying a bit too hard. Or worse, that they were too self-satisfied with their invented terminology. Of course, the main proponents of NCT had the persistence and focus to get the term out there, eventually making their case quite successfully. Perhaps my biggest concern about applications and discussions of niche construction is that I see a tendency for authors to describe populations or species in anthropomorphic terms, suggesting that they seek or intend to improve their environments (to facilitate or augment natural selection, perhaps?). But there’s good reason to put this concern aside. The early NCT proponents recognized a core scientific issue. At its most basic, “niche construction” fills a serious theoretical void. Indeed, the concept of niche has long suffered from a frustrating lack of clarity in definition and usage. And a big part of the usage problem has come from often tacit acceptance of Hutchinson’s (1958) influential emphasis on fundamental niche as an equilibrium phenomenon … or more accurately, as an aspect of the environment that supports wild populations in an evolutionary and ecological equilibrium state. “Fundamental Niche” was a heuristic for thinking about what species may actually be adapted to. With the Modern Synthesis there was already some basic, intellectually mature understanding of the Volterra-Gause competitive exclusion principle (two sympatric species cannot persist in equilibrium in the same niche, so either one wins the competition or the other responds by undergoing directional selection, achieving sufficient niche-shift for co-existence). Hutchinson (1959) also underscored how food chains constrain the niches available to animals in an ecosystem. There was a general appreciation that more productive terrestrial ecosystems–those with higher biomass density and biomass turnover–were likely to have more niches. But there was no way to explain how niches evolve with the populations that occupy them. Given the importance of environment in shaping natural selection in populations–and indeed, in shaping the evolution of reproductive barriers between populations–one could say that around 100 years after Darwin’s most famous and important book was published, there was a need in the biological sciences for someone to write On the Origin of Niches. O.K. I’m being melodramatic. But to a degree, John Odling-Smee, Kevin Laland, and Marc Feldman might argue that’s exactly what they eventually did, with their (2003) Niche Construction: The Neglected Process in Evolution. Through a large number of examples and formalizations of evolutionary processes, they make the well-supported argument that niches are not potential environmental place-holders for species to adapt into. Nor do they simply change on the margins due to competition, sometimes forcing niche shift , sometimes forcing one species to go extinct. Niches change dynamically. And importantly, they change in response to the impacts of the adaptations that evolve in the populations that occupy them. The critical fact that Odling-Smee et al. (2003) manage to illuminate is that niches and adaptations co-evolve. A population’s adaptations and its environment may evolve to a quite resilient dynamic equilibrium. But there is also the possibility that adapted populations alter their environment, contributing to a non-equilibrium niche-adaptation evolutionary dynamic. Evolutionary theory in general really needs a holistic AND dynamic notion of niche. Odling-Smee et al. established terminological priority. “Niche construction” gets the point across. Whether or not it is a theory amounts–at least for me–to semantic quibbling. Niches are emergent evolutionary products, always in flux. Just as metapopulations, species, adaptations, communities, adaptive radiations, or extinction rates are. And so, increasingly, biological anthropologists and archaeologists are thinking about niche construction in Homo sapiens (e.g., Fuentes 2014; O’Brien & Laland 2012; Riel-Salvatore 2010; Smith 2007; Wells & Stock 2007). But this concern hasn’t reached the level of sustained dialogue, debate, and research. Nor has interest in niche spanned the scope of biological anthropologists’ interest in primate evolution overall. As I hope to show in the next section, the niche construction concept–keeping us focused on niche-adaptation co-evolution–does help to explain why the genus Homo, over a longer period of time, has exhibited a non-equilibrium niche-adaptation dynamic, involving what may be very appropriately called biocultural evolution. This pattern is reconstructed based on evidence from fossil and early archaeological sites in much of Subsaharan Africa. But the social, cultural, and technological niche dimensions and adaptations that co-evolved after 2 million years ago in Homo erectus–well, these arguably evolved in a complex process dominated by their tendency for mutual perturbation. New selective pressures and responses became the norm. I would suggest that Pleistocene and Holocene human evolution–that is, from roughly 2.5 million years ago to the present–has involved recurrent episodes of non-equilibrium niche construction and adaption. The process of adaptation, moreover, has involved feedbacks among environment, human biological variation, and cultural symbolically structured systems. Niche-adaptation co-evolution in the genus Homo has been biocultural evolution. Fuentes, A. (2012). Biological Anthropology: Concepts & Connections, 2/e. New York: McGraw Hill. Fuentes, A. (2014). Human Evolution, Niche Complexity, and the Emergence of a Distinctively Human Imagination. Time and Mind, 7(3), 241–257. Hart, D. & Sussman, R.W. (2005). Man the Hunted: Primates, Predators, and Human Evolution. Cambridge, MA: Westview Press. Hutchinson, G. E. (1958). Concluding remarks. Cold Spring Harbor Symposium. Quantitative Biology 22: 415-427. Hutchinson, G. E. (1959). Homage to Santa Rosalia, or why are there so many kinds of animals? American Naturalist 93:45-159. Kaplan, H., Gurven, M., Winking, J., Hooper, P.L., & Stieglitz, J. (2010). Learning, menopause, and the human adaptive complex. Annals of the New York Academy of Sciences 1204:30-42. O’Brien, M.J. & Laland, K. (2012). Genes, culture, and agriculture: an example of human niche construction. 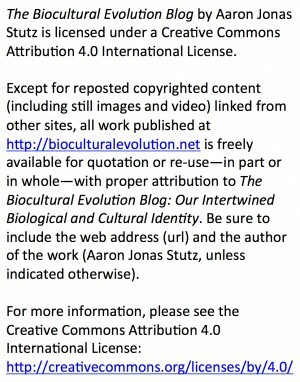 Current Anthropology 53(4):434-470. Odling-Smee, F.J., Laland, K.N. & Feldman, M.F. (2003). Niche Construction: The Neglected Process in Evolution. Monographs in Population Biology 37. Princeton, NJ: Princeton University Pres. Pinker, S. (2010). The cognitive niche: coevolution of intelligence, sociality, and language. PNAS 107(Supplement 2):8993-8999. Riel-Salvatore, J. (2010). A niche construction perspective on the Middle–Upper Paleolithic transition in Italy. Journal of Archaeological Method and Theory 17(4):323-355. Smith, B.D. (2007). Niche construction and the behavioral context of plant and animal domestication. Evolutionary Anthropology 16(5):188-199. Smith, B. D., & Zeder, M. A. (2013). The onset of the Anthropocene. Anthropocene, 4, 8–13. Tooby, J. & DeVore, I. (1987). The reconstruction of hominid behavioral evolution through strategic modelling. In: (W.G. Kinzey, ed.) The Evolution of Human Behavior: Primate Models, pp. 183–227. New York: SUNY Press. Wells, J.C.K. & Stock, J.T. 2007. The biology of the colonizing ape. American Journal of Physical Anthropology, Supplement: Yearbook of Physical Anthropology 134(Supplement 45):191–222. Whittaker, R.A., Levin, S.A. & Root, R.B. (1973). Niche, habitat, and ecotope. American Naturalist 107:321-338.